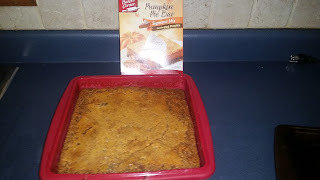 So here's that post I mentioned in the Pumpkin Pie Bar post. I found the perfect coffee to pair with my dessert, and yes I wasn't patient enough and took a bite of my dessert before the pic. If you are lucky enough to find this coffee, grab it and enjoy. 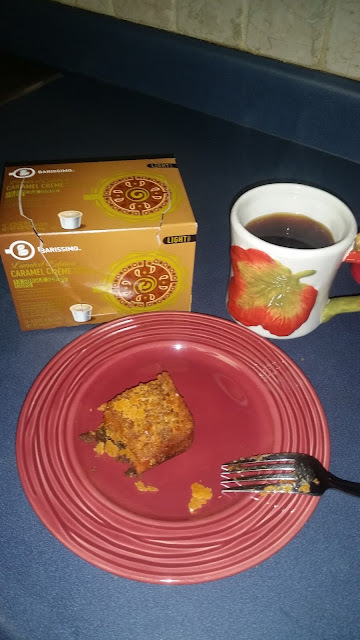 Caramel Creme is another one of Aldi's seasonal individual coffees and it won't disappoint! I'm down to only 4 left and I can't find it at my local Aldi, so I need to send Katie to her side of town. So it's November and my husband is in one of those pumpkin everything moods. He said to me, "Honey, I'm hungry for pumpkin pie." To which I responded to wait until Thanksgiving when my Mom makes it. Katie heard about this conversation and said, "You have the best pie crust recipe and you don't want to make a pie?!" Nope, too much work. So Aldi, I have to thank you for this simple box mix, that hopefully satisfies my husband until Thanksgiving. All you need to make this delightful dessert is water, eggs, and butter. I also used my silicone dish baking dish from Aldi, but I wouldn't suggest using silicone. Stick with a pan. It suggests an 8 x 8, I grabbed this and used two boxes. It was delicious! Stay tuned for my coffee and dessert post! 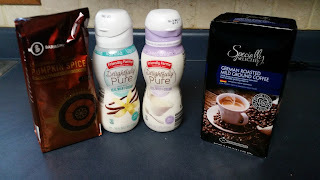 I LOVE coffee, and that is just one of Aldi's great products that I can not live without. My favorite ground coffees from Aldi are the German Roasted Mild Ground Coffee that can be purchased year round. Most recently, my favorite seasonal coffee is the Seasonal Blend Pumpkin Spice which is a light blend. Of course I am not a dark coffee drinker and I like to fufu up my coffee with creamers. Just recently I noticed Aldi is carrying a new line of creamers, Delightfully Pure. In Katie's words, "that's a creamer I can live with; I like the short ingredient list." I have only tried the vanilla flavor, but I just picked up the sweet cream flavor to try. These amazing creamers can be purchased for just $1.79. 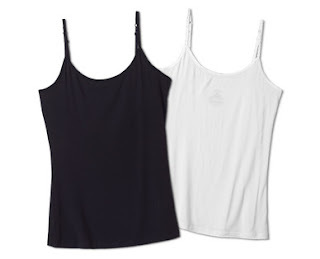 I just picked up a package of these camis for $7.99 for a 2 pack (so $4 a cami!) from Aldi. The packs that came out this time had navy/gray or black/white sets. I was so happy with the fit and feel that I ran back and bought another package in the other color set so now I have all four. The came up high enough on the chest to be useful as a modesty layer and are stretchy enough to stay flat under clothes. I also felt that the small was true to size. Awesome find ALDI!